Danielle Davis, Ph.D. community engagement student and owner of Davis Consulting Solutions, offers opening remarks. 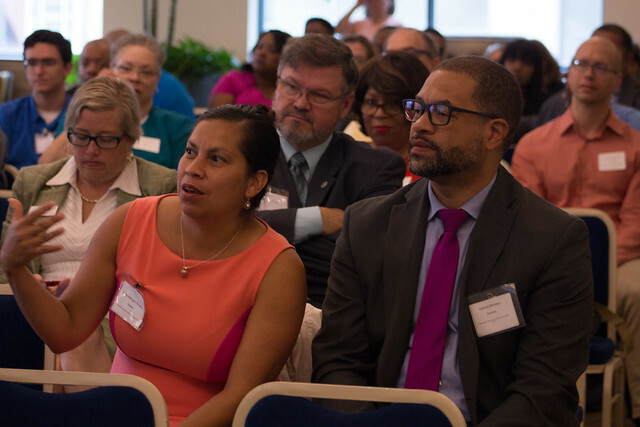 The inaugural Pittsburgh Collective Community Impact Forum - connecting the region's leaders to female and minority business owners and entrepreneurs - was held at Point Park University Aug. 18, bringing in approximately 120 attendees. Co-hosting the event were Danielle Davis, Ph.D. in community engagement student and owner of Davis Consulting Solutions, and Patrick Mulvihill, D.Ed., assistant professor of management at Point Park. Steve Tanzilli, J.D., dean of the Rowland School of Business, welcomed attendees to Point Park's campus and discussed the University's close connection the business industry in Downtown Pittsburgh. "It was important to hold this event on campus because it falls in line with Point Park University's mission to prepare students to achieve their career goals and serve their communities. Several Point Park students took advantage of the opportunity to volunteer at the event," Davis explained. Davis added: "As a student focusing on community economic development in the Ph.D. in community engagement program, it was wonderful to have the support of Rowland School of Business, including Dr. Patrick Mulvihill who will serve as the chair of my dissertation committee." The forum focused on the Pittsburgh region's economic opportunities in technology, construction, urban agriculture, engineering and architecture, based on a model of urban growth that is innovative, inclusive and sustainable. It also addressed the need to increase community awareness of specific business areas in the region where minority representation is lacking. Panel discussions and breakout sessions featured leaders from the Allegheny Conference on Community Development, Office of the Mayor, Urban Redevelopment Authority and more. Founder and CEO of Quintessence Multimedia Melinda Emerson - known to many as America's SmallBizLady - was the keynote speaker. Emerson educates entrepreneurs and Fortune 500 companies on business development and social media marketing and was recognized by Forbes Magazine as the number one woman for entrepreneurs to follow on Twitter. According to Mulvihill, the opportunity Davis provided for people to come together to share their collective experiences and wisdom made the event a very impactful experience. Mulvihill added: "Every successful person knows that the attainment of their vision depends upon the community of people they surround themselves with. The Pittsburgh Community Impact Forum demonstrated in a powerful way this very idea."